Unfortunately, I had my enclosed corporate parks confused. Schjeldahl was writing about Tower 45, which was built in 1988 down on 45th Street. The IBM building was finished in 1983. There were a handful of people enjoying the atrium on the Saturday I strolled through. On its ceiling, the British artist Conrad Shawcross has installed The Nervous System (Inverted), a machine that slowly weaves spools of thread into a thick, multi-colored rope that drops to the ground as it is completed. 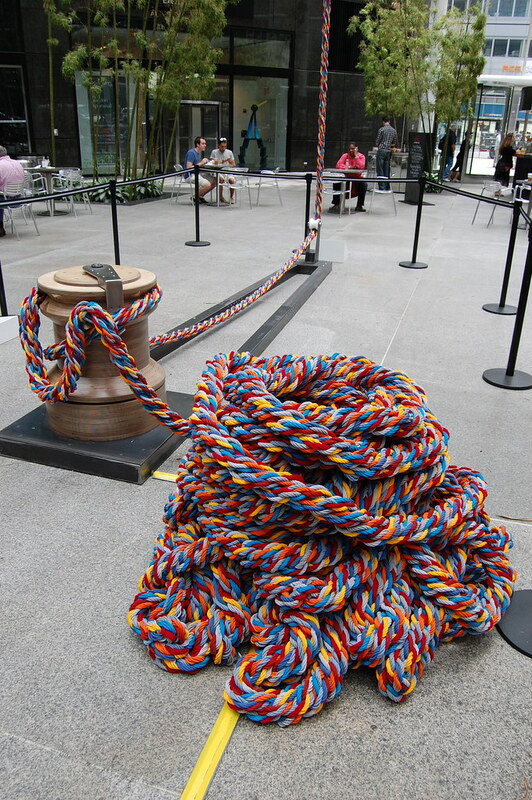 According to New York magazine, there will be 1,700 feet of rope accumulated on the ground by the end of the work’s run on July 10. It’s an infuriatingly boring piece of art. 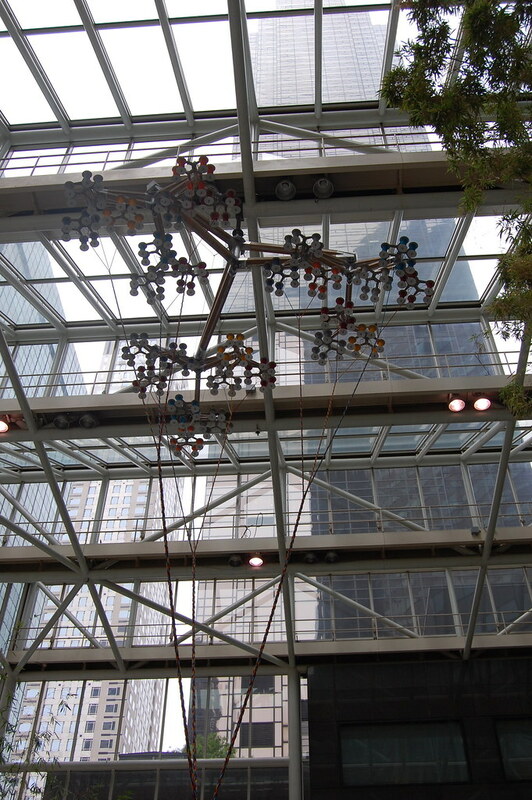 The metal arms up above slide around every few minutes, adding another spin to the braid, but, unless you’re willing to hang out in the atrium all day, you’re not going to see much action. If you do spend a day there, a few extra feet of rope will pile up on the floor, but that’s all that will happen. If you’ll indulge some literalism momentarily: the work does indeed invert the nervous system, leaving it to rest passively, unable to discern much of the actual art-creation taking place. As a work of public art, though, it is a clever little piece. If the goal of public art is to enlighten or entertain the public, to provide some culture for the laboring classes, The Nervous System (Inverted) pretty much refuses those aims, making a mockery of such public, avowedly munificent gifts of culture. Its viewers get to stare at the machine and perhaps see it twitch, but they don’t get much more. 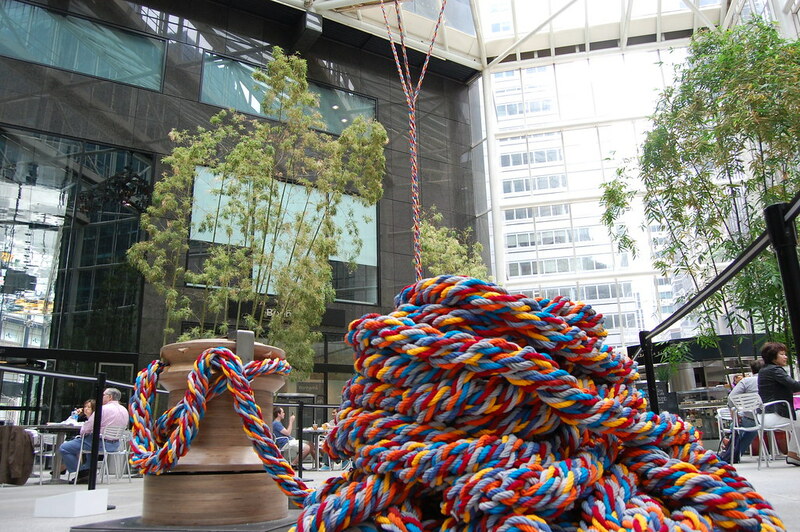 Employees who work in the building get to see the pile of rope grow larger and larger as they head in and out of the office every day. The art will happen without them. 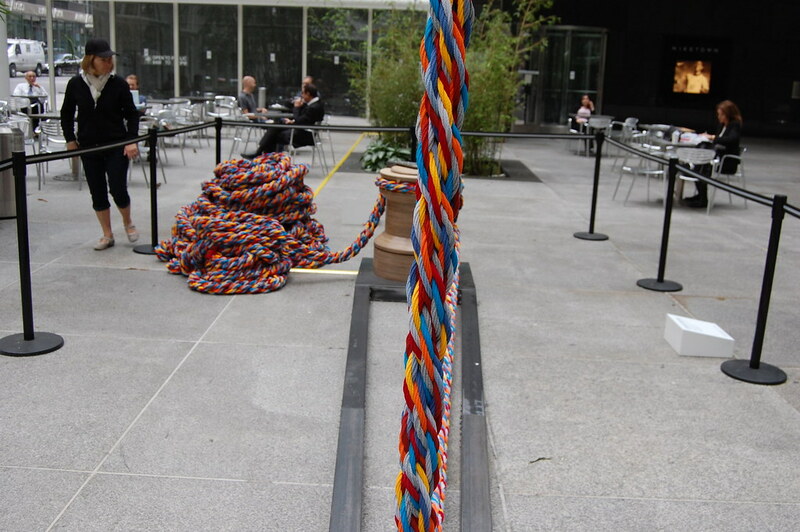 Eventually, it will disappear: the rope will be cut into pieces and sold off to collectors by Pace after the show closes.